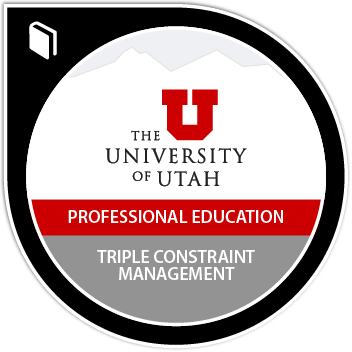 Those who have earned the Triple Constraint Management Micro-certificate have been introduced to the importance of managing project scope, cost and time. They have demonstrated an understanding of project management terminology associated with these concepts. They have learned and practiced scope definition, scheduling, budgeting, and controlling skills. Earners can create a project scope, build a schedule, produce a basic project budget and use tools to track progress. 36 required hours. Complete the 36 hour online training curriculum.